In future, the wallet, purse, paper ticket and pocket have will go digital and live solely on your phone. Say, how would it be possible? Near Field Communications (NFC), a contactless, Wi-Fi-lite style technology that is already in many of the smartphones out there, and will soon be a regular feature of your commute. Okay, so maybe this tech hasn’t hit its stride yet but there are several new mobile phones that claim “NFC” as a feature. So what does NFC mean, how does it work, is it secure and will it finally catch on? These are some questions that many consumers will have as they hear more and more about this technology — and here are some answers. NFC, which stands for Near Field Communications, is a simple yet unique technology that allows small amounts of data to be exchanged when you tap two NFC devices together, or touch one against an NFC tag. At its core, all NFC is doing is identifying us and our bank account to a computer. It’s a short-range, low power wireless link evolved from Radio-Frequency Identification (RFID) technology that can transfer small amounts of data between two devices held a few centimetres (let’s say 10 CM) from each other. Unlike Bluetooth, no pairing code is needed, and because it is very low power, no battery in the device being read. In order for NFC to work, both devices — say, for example, your smartphone and a payment terminal at your local CVS — have to have NFC chips and antennas embedded in them. So, what is NFC used for? Some practical uses include bumping your phone against someone else’s to wirelessly exchange your contact information. You can also tap your phone against a laptop or computer to share photo/ video files. NFC is also used in marketing. You can, for example, tap your phone against an NFC-equipped movie poster or sticker, as long as the paper is embedded with an NFC chip, and more details about the movie will pop up on your phone’s Web browser. One of the more interesting uses we came across in our research was a beer dispenser created by a Google employee. It uses an NFC tablet to scan a person’s badge and determine if he or she is authorized to drink the beer. But, so far, the most prevalent use of NFC has been in payments. By tapping your phone on a contactless payment terminal in a shop, train station or coffee shop, it is able to identify your account and takes payment through an app on your phone. Why is NFC any better than credit card? Many consumers could have a thought that I can already tap my credit card to pay for things than how is NFC better than the credit cards. Yes, they have already used a tap-to-pay method with some newer credit cards but proponents of NFC on mobile argue that it’s even faster and easier to use the device that’s likely already in your hand — your smartphone — rather than digging around for the wallet that holds that credit card. Another big NFC pitch is that your smartphone could simultaneously store loyalty cards, coupons, tickets and boarding passes, so you could use your NFC smartphone to transmit and receive data in those accounts, too. Which phones should you look for better use of NFC? A huge number of handsets have NFC, largely because NFC has long been supported by the makers of Android handsets. Though Apple is yet to embrace NFC, flagship and mid-range handsets from the likes of Samsung, HTC, Motorola, Nokia, LG and Blackberry all include NFC. Microsoft’s Windows Phone 8 OS supports NFC, too, so expect upcoming smartphones from Samsung, Nokia and HTC to be compatible. NFC is still in its trial phase, but it has a big future. ABI Research predicts that 1.95 billion NFC-enabled devices will ship in 2017, largely in smartphones, though NFC will also enter the living room. WiFi routers will swap passwords for a simple ‘tap’ from any smartphone, tablet or games console, with 395 million consumer electronics devices to ship in 2017 – in other words, NFC will be in everything. Tapping to pay sounds almost too easy. Is NFC secure? 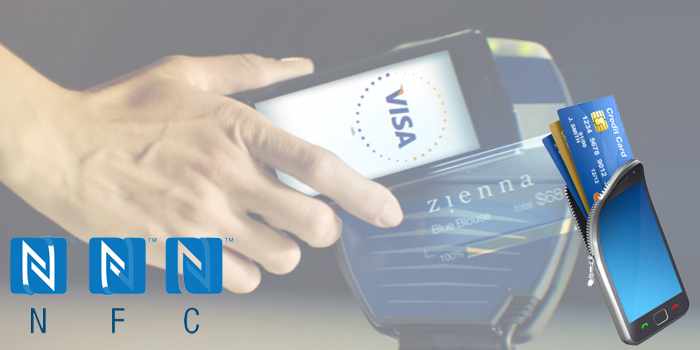 Ultimately, NFC makes it a whole lot easier to perform a huge range of digitized tasks. But with that kind of power in such a tiny chip, is this technology really secure? Many experts say NFC really is fundamentally secure by virtue of its extremely short range. In order to snag your NFC signal, a hacker would need to be very close to you. Uncomfortably close. In other words, you’d know they were there. And unless it was a very intimate friend of yours, you’d likely not be happy about it. Fraudsters are always trying different ways to tap into sensitive data. NFC technology has varying layers of security, depending on the use case and the hardware. When you link your NFC smartphone to your credit card, your data is actually stored in a tiny part of the hardware — like a little lock box within your phone. In some cases, this is in the SIM card, but it could be elsewhere in the phone, too. But note: this data is encrypted. On top of that, you often have to punch in a personalized PIN on the phone in order to make a payment. If your NFC phone is stolen, you can freeze or disable your payment account by calling the services or visiting a website. You can also call the credit card issuers directly and cancel your cards — just as you would if you lost your leather wallet. So will NFC really catch on this time? Some industry experts and analysts say NFC is still “three to five years” away from being mainstream — the same thing many were saying, well, three to five years ago. It has gained traction in parts of Europe and Asia, especially in Japan, where the wireless carriers have collaborated to push the technology. NFC proponents say a mandate requiring retailers to update their payment terminals by 2015 could help nudge the technology along. Though NFC might be new to some, the technology isn’t. The industry standard for it was established between 2003 and 2004. Over the past few years, NFC has become more prominent, but it’s still a long way from mass adoption. But even with all of the tech infrastructure in place, there’s still the matter of changing consumer behavior — your behavior — one tap at a time.